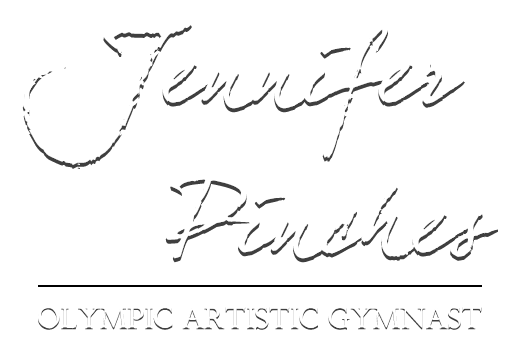 My name is Jennifer Pinches and I was a member of the Women's Artistic Gymnastics team in the London 2012 Olympic Games. I was born in Tunbridge Wells on the 25th of May 1994 and started gymnastics age six, at Fromeside Gymnastics club, after moving house to the outskirts of Bristol. I was spotted by the head coach Liz Kincaid as a potential talent, and therefore moved up from the recreational group to elite gymnastics, where I gradually increased my hours and improved in ability. By the age of nine my personal coach Tracey Kerr was taking me to train at the national centre Lilleshall, every other week, and in the November of 2003 I won my first title- British Level 4 voluntary champion. By age ten I was ranked number one in Britain for my age group. Channel Five featured me in a Documentary called 'A Different Life'. In 2006, I started at the City Of Liverpool Gymnastics Club after moving with my family from the South West to the North West. Becoming part of the City Of Liverpool (notorious for it's success) was daunting at first, but also exciting. My new personal coach was Amanda Reddin, and I joined a group which included Beth Tweddle -2012 Olympic Bronze Medalist- and Hannah Whelan- Double British Senior Champion. In 2010 I became a Senior Gymnast and begun to be recognised internationally, competing at the World Championships in Rotterdam and then winning a bronze medal for Floor at the World Cup, in Glasgow. At the following year's World Championships, I helped GB qualify a full team for the Olympic Games, after a tense competition in Tokyo, Japan. This left only the three Olympic trials between me and one of those five prestigious places on the Olympic team. The beginning of 2012 was not ideal, and I had to drop out of school completely to focus on my training, whilst I struggled to overcome injuries and consequential unfitness. However, with a great deal of hard work and determination, I finally felt prepared for the most important final trial, which was the British Championships at the Echo Arena. This competition was the make-it-or-break-it moment for me, and where I had to prove myself, and I did. I had a brilliant competition, placing second overall, a place higher than the year before and only just behind the Gold, which went to my Liverpool team mate Rebecca Tunney. I also became British Beam Champion 2012, my routine scoring the highest on both the Saturday and Sunday of competition. I was told of my selection for the Olympic Team via phone call, whilst passing the anxious time waiting for it with my mum in Manchester, and I was delighted. The 2012 Olympic team was: Imogen Cairns- who trained under the guidance of my very first gym coach Liz Kincaid- Rebecca Tunney, Hannah Whelan, Beth Tweddle, and myself- all from the City Of Liverpool Gymnastics Club, justifying the club's brilliant reputation. Our team broke the Olympic Record for the best result ever achieved by Britain in the Women's Gymnastics in the Modern Games. I also qualified 21st individually and achieved two Personal Best scores in the Team Finals, on the Floor and Vault. It was an incredible experience to be part of and one which I will never forget, especially because of the meaningful and emotional build up to it. After realising my dream I decided to retire from elite competition and finish my A Levels where I acheived straight A grades in summer 2013. I enjoy doing work to continue the Olympic motto ('inspire a generation') by visiting local clubs and encouraging the upcoming talent of the future, and doing motivational speaking. I have now begun university at University California Los Angeles, where I'm also training with the Bruins college gymnastics team. You can keep up to date with what I'm doing via my blog!